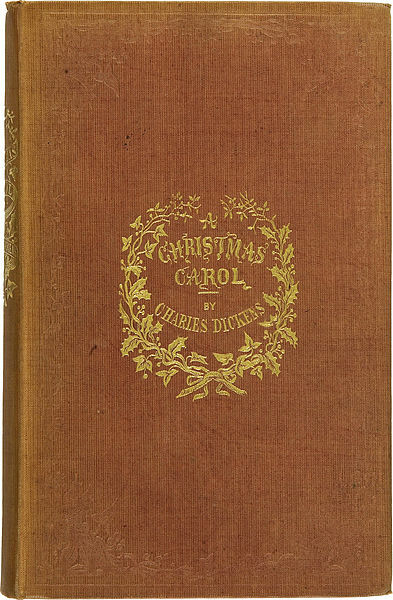 This year marks the 174th anniversary of the publishing of Charles Dickens’ most popular work, A Christmas Carol. When first released in December 1943, critics praised the Christmas story across the board with the consensus being that it charmed both “inwardly and outwardly.” A Christmas Carol was the most successful book of the 1843 holiday season, selling out its initial six thousand copies by December 25th. 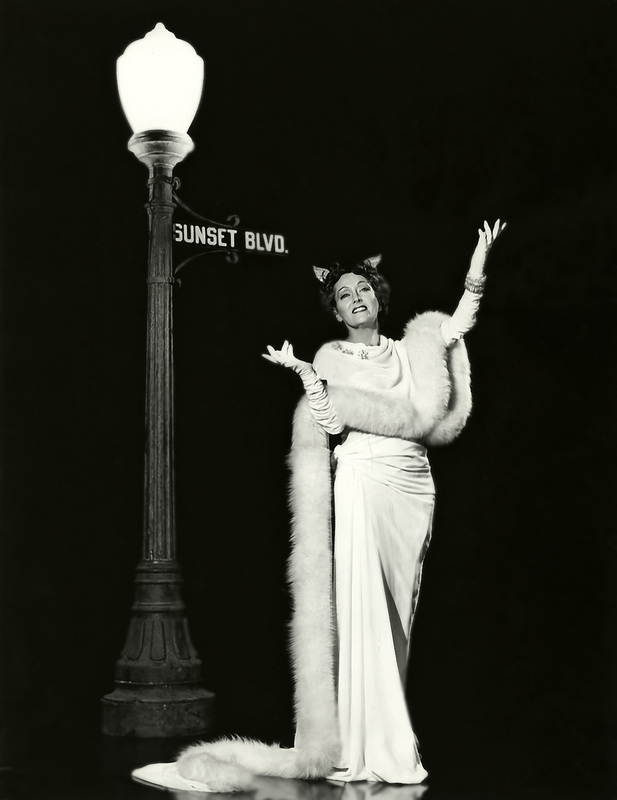 Within two months eight stage adaptations were in production and by May 1844, a seventh edition had sold out. The better part of two centuries later not much has changed as far as the popularity of the classic Christmas ghost story as viewing one of the many adaptations produced through the years is now ingrained in popular tradition. I have a few favorites and make it a point to watch at least one every year. Dickens’ message, which is that everyone can find redemption by opening his/her heart at Christmas and keeping it open to all throughout the year is universal and everlasting. In honor of Charles Dickens’ beloved work and, of course, because the Christmas season is upon us, I called on three popular names in cinema for an homage. 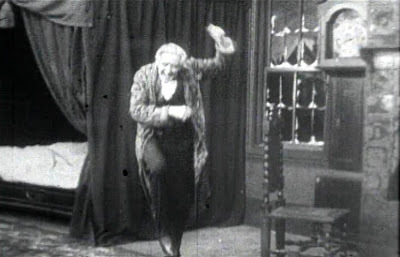 The first, Thomas Edison whose Edison Manufacturing Company produced one the earliest film versions of A Christmas Carol. Then by way of Old-time radio, one of my favorite Christmas broadcasts, which is narrated by Orson Welles and stars Lionel Barrymore as Ebenezer Scrooge. Following is my commentary on the first, and the audio of the second. 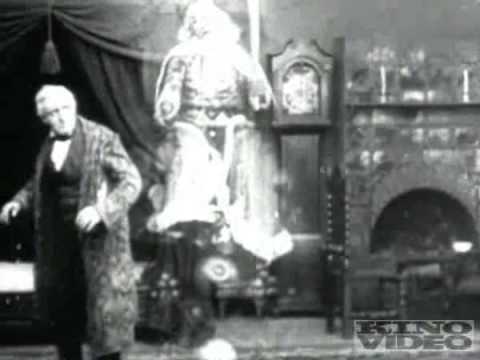 Edison’s A Christmas Carol is an eleven-minute film, directed by J. Searle Dawley which was released on December 23, 1910. I believe it is the earliest film version available in its entirety. The 1910 short silent stars Marc McDermott as Scrooge and Charles Ogle as Cratchit. Since I’m relatively new to watching these early silent films, I was thrilled to recognize Ogle from the Edison Frankenstein I watched earlier this year, also from 1910. A few months ago I’d never heard the name. Hooray for me! Anyway, Edison’s production of A Christmas Carol is quite good. It features great costumes and what had to be exemplary special effects at the time – still impressive today, I have to say. After watching this film I find myself, yet again, astounded at how economically these complete stories are told in such short productions. 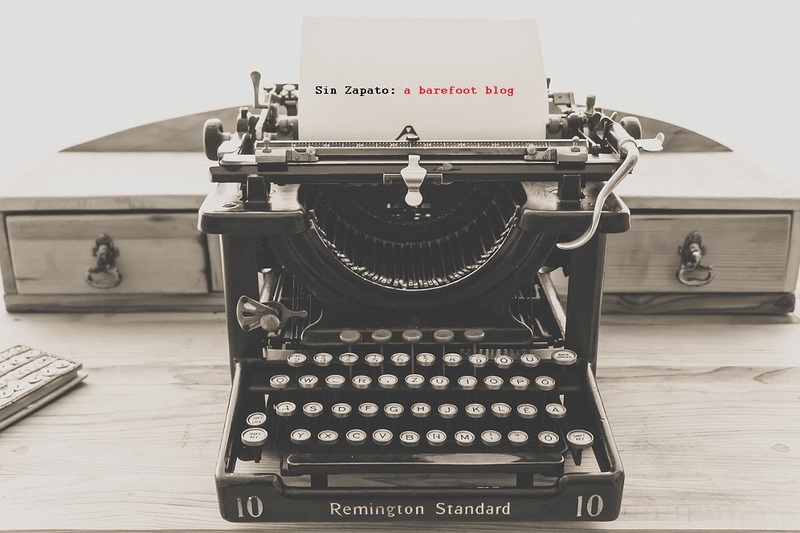 This story starts on the day before Christmas when a group from the Charity Relief Committee ask “hard-fisted miser,” Ebenezer Scrooge for a donation while he’s at work. Scrooge spurns them and tells them to leave immediately. Soon after the old man’s nephew, Fred stops in with his fiance and another couple. Again, the bitter man treats them with disdain, even refusing to shake Fred’s hand and tells them to leave. Now it’s the end of the work day and as poor Bob Cratchit prepares to go home he receives a scolding from Scrooge who’s never satisfied with the hours Cratchit puts in. 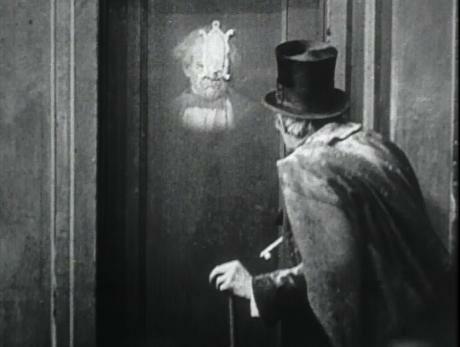 That behavior is enough to start the spiritual messaging because as soon as Scrooge gets home he sees the ghostly face of his former partner, Marley, who warns him that unless he reforms a grim future awaits. After Marley’s ghost leaves, The Spirit of Christmas appears. 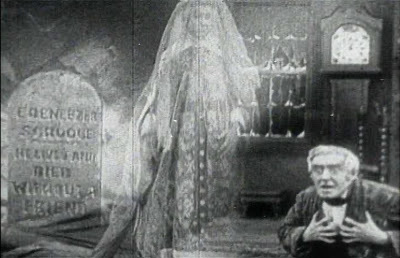 Rather than separate “past, present and future” ghosts as featured in many other adaptations of A Christmas Carol this movie has just the one spirit who, through his magic, makes the visions appear right in Scrooge’s own bedroom. The first set of visions that appear before Scrooge are “incidents of his youth and early manhood,” which include a scene depicting his first love, as a young man at a swinging party and at work. The present shows the miser what his wealth can do with a scene of the Cratchit family Christmas, a happy one despite the few provisions they have. Then Scrooge’s nephew appears, scorned by his fiance because he’s poor. To bring the message home, a very effective example of “Want and Misery,” which takes the form of a beggar at Scrooge’s feet. Scrooge is both shocked and genuinely moved. The next morning Scrooge is “awakened to a new life” by carolers. Realizing he is still alive and in the present he does a happy dance before tossing all the money in his pockets out the window for the boys to enjoy. Finally, “the Spirit of Christmas is at work” as we see Scrooge make a donation to the members of the Charity Relief Committee who he happens upon on the street. Next, he makes his nephew his business partner guaranteeing he can marry the girl of his dreams. And finally, he visits the Cratchit family and brings along all the fixings for a luscious Christmas feast, dabbing his eyes upon seeing the joy he has spread. 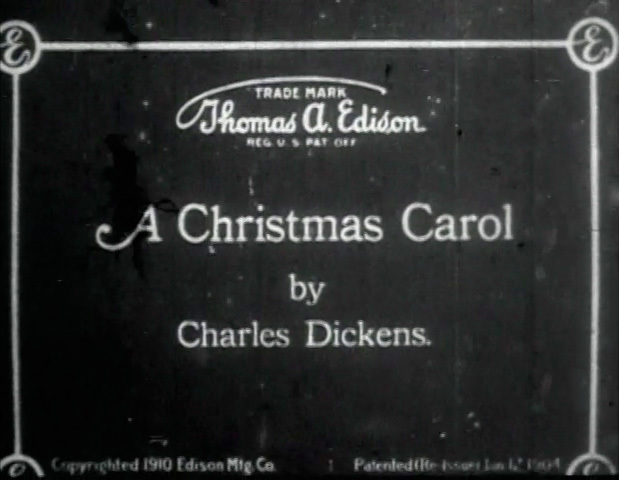 I watched Edison’s A Christmas Carol on internet archive, which has a fine print available for free, but if you’re interested in owning it the film is included in the Christmas Past – Vintage Holiday Films set that is available on Amazon. 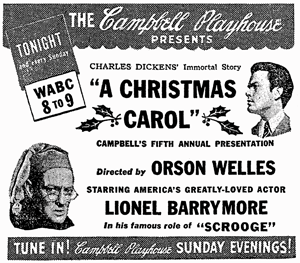 The celebration continues with an adaptation of A Christmas Carol that I listen to every year, The Campbell Playhouse version produced, directed and narrated by Orson Welles and which, as mentioned above, stars Lionel Barrymore as the miserly Scrooge. It’s worth mentioning that Lionel Barrymore first dramatized the role of Ebenezer Scrooge on CBS Radio on December 25, 1934, which started a yearly tradition that would last until 1953. Only twice (as is noted on the ad below) did Lionel not play the part in all those years: in 1936, when his wife passed and his brother John Barrymore filled in for him and again in 1938, when he fell ill and Orson Welles took the role. This particular broadcast originally aired on December 23rd 1938 and for some reason it’s my favorite of the versions I’ve heard. Lionel Barrymore had the perfect Scrooge voice. Enjoy! OH! Craig, I appreciate the correction. AND appreciate you including the link to your book! I’ll change the year notation on this post.